The Hound design Wool Area Rug symbolises the loyalty and value of Wolfhounds in ancient Ireland. It features a brown and gold illustration on a blue background. 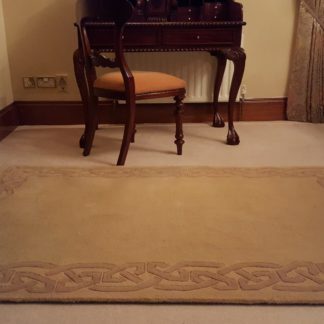 It is one of our most popular designs in Celtic Rugs. This Handmade, Hound inspired Wool Area Rug, was inspired by the Celt’s most valued companion, The Wolfhound. It features a brown and gold illustration with a matching border, on a dark blue background. The border is typical of those found in the Book of Durrow, while the spiral of knots is from the Book of Kells. This design’s centrepiece is based on the hound, or Cú, which was a valuable companion of the ancient Celts. A famous Irish legend tells of Cú Chulainn, a mythical Irish warrior who was born Setanta. He killed Culann’s wolfhound in self-defense, then offered to take its place until a replacement could be found. Noted for their great size, the wolfhounds were used to hunt large game and even pulled men from horseback in battle. Devoted hounds are often mentioned in Celtic myths, such as Bran and Sceolan which belonged to Finn mac Cumhail. Underworld hounds, such as the Welsh Cwn Annwn belonging to Arawn. The Devoted hounds protect their masters to the end, whereas the Underworld Hounds run down and punish the guilty. Dogs are a favourite in Celtic scripts, such as the Book of Kells and the Book of Durrow. We have designed this rug to suit any modern living space. It can be an interesting conversation topic in a living room, hallway or a bedroom. It has been handmade using hand-tufted wool and dyed using high quality acrylic. This dog inspired piece makes not only a beautiful area rug, but also an elegant wall hanging. Please note, we do not supply a wallhanging kit with this rug.